Add this shop to my favorites. Abissinie ou Haute Ethiopie - Du Val (1688). Availability: in stock Condition : Very good, please study image carefully. Date : 1688 Overall size : 14.5 x 15 cm. Image size : 10 x 13 cm. 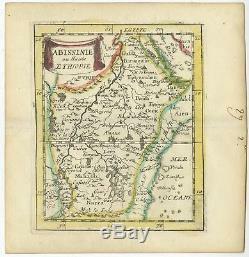 Description: Antique map Africa titled'Abissinie ou Haute Ethiopie'. Miniature map of Ethiopia, this map originates from. La Geographie Universelle' by P.
He was the nephew of Nicolas Sanson, the leading French mapmaker of the period, and Geographer to the King of France from 1650. The item "Abissinie ou Haute Ethiopie Du Val (1688)" is in sale since Friday, November 2, 2018. This item is in the category "Antiques\Maps, Atlases & Globes\Africa Maps". The seller is "bartele-gallery" and is located in Langweer. This item can be shipped worldwide.